These personal experiences are a snapshot of the unnecessary suffering MSF medical staff see first-hand daily in places where people can’t get adequate medical care and that could be avoided with proper, sustainable funding and investment. We’re doctors and nurses, not bankers, but we can see how investing in real futures – like the futures of the people profiled here - will transform the lives of those made vulnerable through illness, and create a strong foundation for their families and their communities to build on. That’s why MSF supports calls to direct a small but permanent portion of a new financial transaction tax (FTT), proposed by some governments, to meet global health needs. A regular stream of funding would help provide some funding to address unchecked health crises around the world. The accounts told here of individuals that have benefitted from a medical intervention, might be just a drop in the ocean, but what we see in their story is the possibility of an amazing impact if the interventions that saved their lives could be made available on a wider scale. An allocation of proceeds from the FTT for global health could help make that possible. Each year, Natacha, a single mother in Burkina Faso, struggles to get her children safely through the precarious time between harvests when food is scarce and young children are particularly vulnerable to malnutrition. Malnutrition contributes to the death of well over two and a half million children under the age of five. Ready-to-use foods have been used for some time to save the lives of dangerously malnourished children. Now we know that providing children who are at risk with supplemental foods, that meet their nutritional needs, will spare them from irreversible consequences on their growth and development and prevent them from falling into the life-threatening severe form of malnutrition. This kind of intervention could help Natacha and give longer term protection to her son, Alexi and his siblings. Alexi was malnourished before reaching his first birthday. He lives with his mother Natacha and his two siblings in a small village in northern Burkina Faso. Natacha grows millet for the family. But the grain she harvests lasts them only four months and they go hungry the rest of the year. The markets are full, but she cannot afford to buy the food she wants. Alexi is at the most vulnerable age for malnutrition – between six months and two years and his diet was not providing him with the essential nutrients he needs to grow, be healthy and fight off infections. “Eating millet porridge every day is the equivalent of living off bread and water,” says MSF’s nutrition advisor Susan Shepherd. Worried about her son, Natacha took him to MSF’s hospital. “When I got there, they took him in their arms. They told me he was sick.” Without treatment, Alexi’s condition was likely to become life-threatening. Natacha was given a supply of packets of peanut paste containing milk powder, sugar and oil, and enriched with vitamins and essential nutrients as treatment. This ready-to-use food needs no refrigeration or preparation, and can be fed to children by their parents at home. Alexi responded well to the treatment: he gained weight steadily, and after just a few weeks was out of danger. Alexi was given ready-to-use therapeutic foods developed to treat children already at a dangerous stage of malnutrition. But if his mother, Natacha, had been able to get hold of what are called supplemental foods, that contain sufficient nutrients for a growing child, then Alexi might never have fallen ill through acute malnutrition in the first place. His life and many other children that live in similar contexts of humanitarian crises could be protected this way. But today, the lack of funds means the foods needed to address malnutrition are all too often rationed to the severest cases. US$ 35 will buy 150 sachets of ready-to-use supplementary food used in nutritional programmes to prevent malnutrition. Each sachet costs $ 0.23. It's estimated just over $ 6 billion a year will cover the costs of supplying enough therapeutic and supplemental Ready-to-Use foods to fight acute childhood malnutrition worldwide. In 2010, MSF treated over 300,000 children with severe acute malnutrition and distributed the latest generation of nutritionally-enhanced supplements to over 150,000 children, in 28 countries. Carmen is 32 years old. She lives in Tete, a town on the Zambezi river in northern Mozambique, with her husband, Victorino, and two children. She found out she was HIV-positive in 2007 and started on antiretroviral treatment in 2009. Today she is alive and healthy, looking after her family and going to evening school to improve her qualifications. Today, more than six million people living with HIV are alive because they are receiving life-saving antiretroviral treatment. 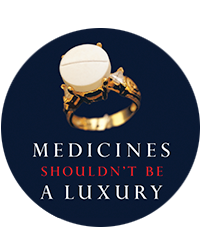 But nearly nine million more are still waiting to get these medicines and will die without them in the next several years. Getting more people on treatment not only saves more lives, it also dramatically reduces the risk of new infections, offering a way forward to halting the spread of the AIDS pandemic. With funding to expand treatment, many more people like Carmen, in Mozambique could have real futures to plan for with their families and in their communities. And we could see light at the end of the end of this HIV/AIDS tunnel. Now I take my pills two times a day, at seven in the morning and seven in the evening. And right from the start, I began to feel better. “Before, my husband would come back from work and find me bedridden, so he would start cooking for me, washing my clothes and the dishes. But now the medicines have really changed my life – now I can cook alone, I can wash and I am running a small business right here at my place, selling biscuits, sweets, soap, washing powder, salt, fire roots and charcoal. And my daughter has also been a big support to me – more like a close friend. What I would say to people who are living with HIV is don’t be afraid. It doesn’t mean the end of your life. Just follow the doctor’s instructions, go to counselling and take your drugs. There is so much to live for. It costs roughly US$150 for the HIV medicines to treat a person for one year. UNAIDS estimates that by dramatically expanding treatment now, seven million deaths and more than 12 million new infections can be averted by 2020. This would require an additional $6 billion each year. The funding shortfall: Donors are radically scaling back on funding global HIV/AIDS. The main funder of global HIV programmes, the Global Fund to Fight AIDS, Tuberculosis and Malaria, for the first time in its ten-year history has had to skip a year of approving new proposals because of lack of funding. It needs an estimated US$4.5 billion over the next two years to fund new proposals, but only has $800 million. MSF began providing antiretroviral treatment to people living with HIV/AIDS in 2000 and today provides treatment to 170,000 people in 19 countries. At 21 years old Phumeza should have her whole life to look forward to. Right now she’s confined to a bed in a tuberculosis (TB) care centre in Khayelitsha near Cape Town, South Africa on treatment for the most virulent form of TB currently known – extensively drug-resistant TB, or XDR-TB. Last year for the first time in ten years the number of people dying from TB worldwide dropped but still every year we miss diagnosing and treating around three million cases of TB. And half of those people die as a result of not being treated. So many people with this curable disease fall through the net because, until recently, the tests to confirm that someone has active TB or not have been so completely inadequate. Now, a new test using molecular technology is clearing the path for getting many more people on the treatment they need earlier. It’s still only a start - too many patients will still be kept waiting for a diagnosis so they can get the treatment they need but some first steps have at least been taken to improve TB diagnostics. Finally, nearly two months later Phumeza was diagnosed in hospital with MDR-TB (multidrug-resistant TB) by which time she was so ill she was forced to drop out of school. “Sometimes I didn’t know whether I was coming or going,” she says of the experience. This agonising wait could have been much shorter had Phumeza’s nurses had access to a new desktop diagnostic machine, that has since arrived in Khayelitsha's clinics. The device can diagnose drug-resistant TB within just two hours - older diagnostic methods take up to four months to confirm drug-resistant TB and many patients have died, while waiting for a diagnosis that arrived too late. “This new test is so empowering”, says MSF’s medical officer Dr. Ian Proudfoot, who works at the Ubuntu clinic in Khayelitsha where the new test is being trialled. “It’s completely the opposite of the immense sense of powerlessness you feel when…you’re seeing a patient dying in front of you and are absolutely powerless to do something about it because you don’t have a diagnosis." Phumeza herself is now on the treatment she needs finally. But she’s reassured the test will spare others in her position the agonising wait in future by delivering quicker and more accurate results. “I don’t blame the doctors for not diagnosing me earlier – the smear test couldn’t give them the right result. But this new test will save lives. One test cartridge of the new test costs at best US$ 17 and the each machine is priced at $17,000 in developing countries. Those costs are still very high for developing countries and efforts must be made to reduce them and come up with a test that is equally well performing but cheaper. Treatment for drug-resistant TB can be up to almost $9,000 - nearly 475 times more than a $19 treatment course for drug-sensitive TB. $1 billion is needed for R&D for better tools including the development of a rapid and more affordable point-of -care TB test and new and better drugs. In 2010, MSF treated close to 30 000 people for tuberculosis. This includes 1,000 people with drug-resistant TB across 15 countries. Catherine Atieno is HIV positive and the mother of four children. She lives in Kibera, a slum on the edges of the Kenyan capital where she works in the local MSF clinic. Her daughter Joanne, was born with the HIV virus before Catherine knew her own HIV status. Lucky Grace, her youngest daughter was born after Catherine started antiretroviral treatment and doesn’t have the virus. Nine in ten of the 2.5 million children living with HIV acquired the virus from their mother either during pregnancy, birth or the breastfeeding period. But these infections are entirely preventable, by putting the mother on HIV treatment, as well as the baby on prophylaxis at birth and during breastfeeding. In wealthy countries paediatric HIV has almost been eliminated with the risk of transmission cut to 2%. Expanding prevention of mother-to-child transmission (PMTCT) services could ensure that many other women, like Catherine Atieno from Kenya, are able to protect their families from HIV. Shortly after Catherine started antiretroviral treatment, she discovered she was pregnant with her fourth child. She feared that she would pass on her HIV infection to her child. Three years earlier, her elder daughter Joanne was born with the virus when Catherine did not know she was HIV-positive. Catherine confided her fears to a friend who worked in one of MSF’s clinics in Kibera. As a result, Catherine enrolled in the Prevention of Mother to Child Transmission programme at the clinic. Catherine was already taking antiretroviral drugs for her own health. And during delivery of her baby, the child was also given medication. The family is very close. Lucky is a constant source of delight. And Catherine is very protective and loving too, of Joanne, her older daughter who contracted HIV before Catherine knew her HIV status and could get the medical care to reduce the risk of transmission of the virus. But she has great hopes for all of her children and their future together. It costs roughly US$150 per year for the medicines for a pregnant woman for her own health, although much less if she needs a short-course for prevention. It costs around $40 for the medicines for the child for a one year treatment period. With access to antiretroviral medicines and appropriate health care, more than 98 percent of pregnant women with HIV do not pass the virus on to their babies. An estimated 370 000 children were newly infected with HIV in 2009, the vast majority of them through mother-to-child transmission. Half of those are likely to die without HIV medication before they are two years old. MSF provides PMTCT services in all of its HIV/AIDS programmes in 19 countries. In Khayelitsha, South Africa, MSF and the South African government have helped to reduce transmission of HIV by 250% down to similar transmission levels in developed countries. Earlier this year, Dr. Northan Hortado and his colleagues, faced with an exploding measles epidemic in the Democratic Republic of Congo, took part in a massive emergency response programme and vaccinated three million children. Lack of support for basic immunisation programmes means that MSF teams are seeing more and more measles outbreaks that are unnecessarily claiming children’s lives. Great strides have been made to rid the world of measles - one of the biggest childhood killers that used to claim over two and a half million children’s lives a year. Following the launch of a global initiative in 2001, the numbers of children dying of measles-related conditions dropped by 78%* But recently, donors have cut back on funding measles immunization efforts. This trend now threatens to reverse the tremendous gains made. “The epidemic began to appear in scattered fashion," says Northan Hurtado, a doctor working for MSF in Katanga province in the Democratic Republic of Congo "At the start, rural areas were most affected. Then the cases started increasing in urban areas." Dr. Hurtado witnessed the measles epidemic from the beginning. It gained ground quickly, spreading through Likasi district where 31 children died, and then arriving in the provincial capital, Lubumbashi, where 791 children fell ill. The outbreak then headed north. “It is spreading like wildfire,” reported MSF mission head, Gael Hankenne. That same month, MSF teams launched an emergency response to the outbreak with a plan to vaccinate approximately 1.2 million children in Katanga in order to try to contain the epidemic of this most contagious of childhood diseases from spilling over and engulfing the rest of the country. Over the next few months, MSF teams and local health authorities worked together, trying to keep pace with the epidemic as it spread from province to province. They travelled vast distances, over difficult terrain to the most inaccessible areas, with vaccines that had to be kept cool in the tropical Congolese heat. Three million children were vaccinated in total as a consequence of the emergency response. But the epidemic was not halted in its tracks. There is frustration that many young lives were lost that could have been saved if routine measles vaccination programmes and catch-up immunization campaigns to protect young children from the disease were adequately supported and funded. "The problem is that the fight against measles is no longer seen as a political priority – not within ministries of health and not by donors, who are reducing funding," said Gwenola François, measles vaccination campaign manager in the DRC. "It costs just one dollar for the vaccine to protect a child against measles for life. Organisations like MSF cannot just continue to rush in to put out the fires caused by these…long term deficiencies of measles prevention programmes." The funding shortfall: There is a present funding shortfall of $ 43.4 million to reach this target. In 2010 alone, MSF vaccinated more than 4.5 million children for measles in emergencies in countries including Chad, Malawi, South Africa, Yemen and Zimbabwe. Currently, MSF is continuing to respond to measles outbreaks in nine African countries. The people featured in ‘5 Lives’ stand witness to how medical interventions have already changed lives for the better; others did not have access and suffered as a result. Their stories together demonstrate how with more investment, many more lives could be turned around to help people thrive in their families and communities. But for this to happen, there needs to be a serious, long term and sustainable investment in real futures. Funding gaps are already eating away at medical gains made over the last decade. Right now, there’s a tremendous crunch on financing for global health, as donor governments everywhere retrench. Already HIV/AIDS, TB, and malaria funding has taken a huge hit and other funding streams are also looking precarious. Now is the time to raise the level of funding available to meet global health needs today and in the future. A financial transaction tax currently offers the most promising solution; but we need to work to be sure that a proportion of this new tax will indeed be protected for spending on global health. You can help us do this by supporting the push for a commitment to this funding allocation that would provide regular, predictable, additional, & sufficient funding levels to global health.